The gang at Graffiti HeArt is busy this spring helping facilitate public art opportunities for local artists with businesses throughout Northeast Ohio. This weekend, Graffiti HeArt helped organize the production of four new murals at Crocker Park in Westlake. Earlier in the month, Graffiti HeArt helped the CLE Urban Winery commission a mural for its new space in Cleveland Height’s Cedar-Lee District (slated to open July 1). This weekend, local artists created four new large scale murals in front of mystified viewers and passersby. 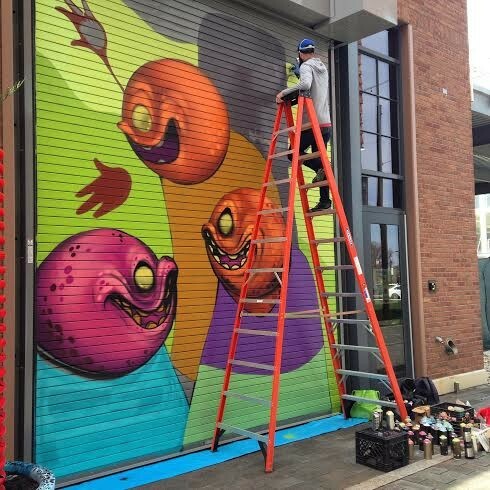 The artists painted on rollaway garage doors covering the soon-to-be open store fronts of local favorites the CLE Clothing Company, Colossal Cupcakes, D’s Accessories and Kernels by Chrissie. While the murals will be hidden during regular business hours, guests of the neighboring Hyatt are sure to enjoy the murals on early morning or late evening strolls. The murals and accompanying planters add much needed, distinctive character to the ultra-contemporary, (and ever-expanding) suburuban retail metropolis. Graffiti HeArt invited local artists known for both their street art and fine art gallery work. On Saturday, Rich Cihlar, Bob Peck, Ashley Nagel and Alex Tang worked side-by-side to produce three murals (Cihlar and Nagel worked together). On Sunday, Steve Ehret stopped by to complete the project with a few of his familiar, friendly monsters. The murals are surrounded by tall planters, also painted by local artists, including Bob Peck and The Sign Guy. 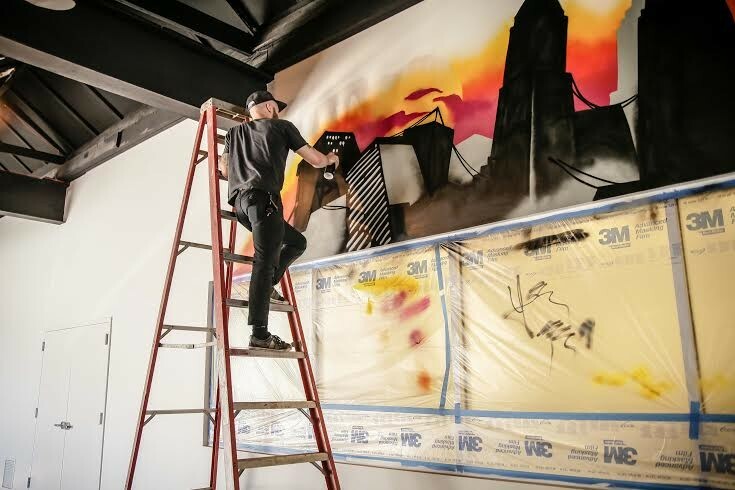 Graffiti HeArt was approached by Stark Enterprises last year about the possibility of incorporating graffiti-style murals into Crocker Park’s new micro-retailer spaces. In their initial meeting, Stark Enterprises expressed interest in reaching out to international artists from countries with stronger street art cultures. However, Stamy Paul used her experience with local artists to successfully persuade Stark to use local artists to create world class street art. The murals are currently on view 24/7 until the micro retail spaces open in May. Then, you’ll have to check them out before or after regular business hours. Additionally, Graffiti HeArt and Bob Peck teamed up to create a mural for the soon-to-be CLE Urban Winery and its owner Destiny Burns, a Cleveland native, retired Navy officer and volunteer firefighter. The winery is a renovated former garage space. It will be divided into spaces for wine making and wine tasting. Guests will be able to witness the wine making process through large windows between the spaces. The commissioned mural began as a discussion with Stamy Paul and Graffiti HeArt regarding a philanthropic interest in funding one of Graffiti HeArt’s scholarships for the Cleveland Institute of Art’s Pre-College Program. Giving back is an important part of the business model for CLE Urban Winery. Burns promises more altruistic efforts once the winery opens its doors in July. Additionally, Graffiti HeArt and CLE Urban Winery are discussing plans for more local artwork to fill the space, as well as monthly art-themed events. Interested in making your own wine? CLE Urban Winery allows customers to create your own wine batches with the help of their winemaker. A batch fills about 28 bottles and includes your own custom label. Burns also promises a Wine Club with discounts, special access to winemaking events and members-only receptions. The winery will host events with special areas for groups of 10 to 35, and the whole winery can be reserved for groups of up to 70. Look for more information closer to the opening this July.